AllegroMedical.com presents The SinuCleanse Nasal Squeeze Bottle System. 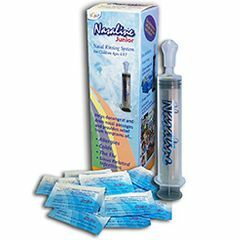 Nasaline is a unique, patented, drug-free nasal rinsing system designed by a team of Swedish ear, nose, and throat specialists. With the simple use of saline solution, Nasaline effectively washes away unwanted mucus, crusty secretions or allergens and provides relief from symptoms associated with allergies, colds, the flu and other sinus related infections. After a prolonged stay in dry, dusty, or smoky environments, Nasaline cleans and soothes the nasal passages, reducing nasal irritation and moistening the mucous membranes.